Photo 023. Bismarck in Dry Dock. Bismarck in Dry Dock. A view of Bismarck in the floating dry dock No. V-VI in July 1940. 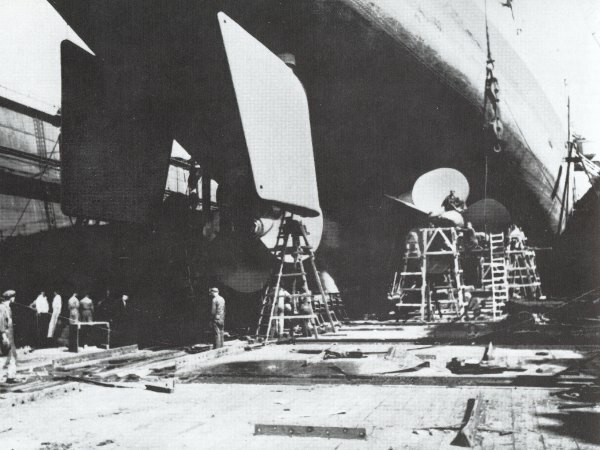 At this time the three propellers were placed in position. Each propeller had three blades and a diameter of 4.70 metres. The port and middle propellers rotated counter clockwise and the starboard propeller clockwise. The two parallel rudders of 24.2 m² each were inclined from the vertical with 8º divergence towards the centreline.